Looking for a modern, high performance cooking range for your kitchen? 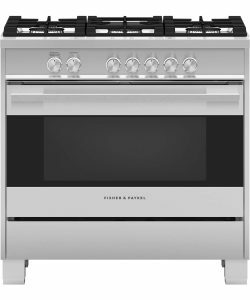 Consider the cooking line from Fisher & Paykel. Established in 1934, this major appliance manufacturer is a global mainstay operating in 50 countries and manufacturing in Italy, Thailand, China and Mexico. The Haier Group (owner of GE Appliances) bought Fisher & Paykel in 2012. In keeping with the original plan of expanding, Fisher & Paykel is now part of a global empire. They are continuing their development of a global premium brand. Contemporary style: clean, minimalist and beautifully designed. Professional style: built to last, strong bold styling with attention to performance. Classic style: styled to add warmth and tradition to any kitchen. Integrated style: this is the perfect blend of the best features of contemporary, professional and classic styles all rolled into one. This very stylish freestanding range has the capacity to cook multiple dishes with precise control. This model has a spacious gas cooktop and self-cleaning convection oven. Nine oven functions including Roast and Aero Pastry™ — there’s even a pizza mode and rapid proof for making bread! 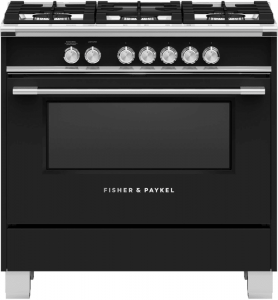 Heritage styling with contemporary performance is what this gorgeous 36” Fisher & Paykel cooking range is all about. 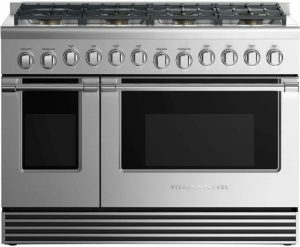 This convection oven and a spacious cooktop will add to your cooking pleasure. This classic style comes in a stylish black finish. Professional styling makes cooking space limitless. Cooking for a crowd? No problem with this model! The integrated styling allows you to have design freedom for your kitchen, along with Fisher & Paykel quality of performance and functionality. For full appliance list go to www.fisherpaykel.com. Are you shopping for your kitchen remodel and need some good advice? Want to contribute your own reviews on your favorite home products? Join Revuu.com and search our reviews by brand, or leave your feedback! No responses / comments so far.